DETROIT — The collapse of the Detroit Lions is essentially complete. 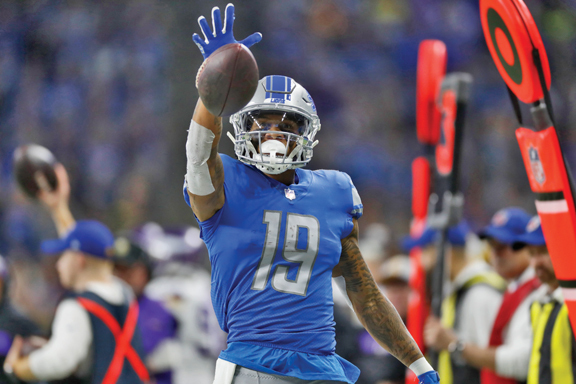 There’s still one more game to go, but the Lions are now assured of their first last-place finish since 2012 after a 27-9 loss to the Minnesota Vikings on Sunday. Detroit actually dominated the first 25 minutes or so, but the Lions allowed Minnesota’s Kyle Rudolph to catch a Hail Mary touchdown with embarrassing ease with no time remaining in the first half. That play put Detroit behind for good. Detroit (5-10) will end up in the NFC North cellar for the first time since going 4-12 in 2012 under Jim Schwartz. The Lions fired coach Jim Caldwell after going 9-7 last season, and in the first year under Matt Patricia, they will end up with a worse record than in any of Caldwell’s four seasons in Detroit. One of the low points of Caldwell’s tenure came in 2015, when Aaron Rodgers threw a 61-yard touchdown pass to Richard Rodgers with no time remaining to give Green Bay a 27-23 win over the Lions. Detroit seemed ill prepared for that play, and the defense wasn’t much better Sunday when Minnesota tried it. Aside from that Hail Mary, it wasn’t a bad performance by the Lions on defense. They held Minnesota (8-6-1) without a first down for the whole first quarter, and Detroit was up 9-0 in the second. The game turned when the Lions left Adam Thielen all alone on third-and-17, and Kirk Cousins found him for a 40-yard gain. That set up a touchdown with 1:32 left in the half. Minnesota got the ball back, and the Vikings made it to the Detroit 44 with 2 seconds left. Cousins had plenty of time to throw to the end zone, and Rudolph made the catch without even falling down. Detroit managed only 74 total yards in the second half. The offense was without rookie running back Kerryon Johnson and receiver Marvin Jones, both on injured reserve.